To Be Cared For offers a unique view into the conceptual and moral world of slum-bound Dalits (“untouchables”) in the South Indian city of Chennai. Focusing on the decision by many women to embrace locally specific forms of Pentecostal Christianity, Nathaniel Roberts challenges dominant anthropological understandings of religion as a matter of culture and identity, as well as Indian nationalist narratives of Christianity as a “foreign” ideology that disrupts local communities. Far from being a divisive force, conversion integrates the slum community—Christians and Hindus alike—by addressing hidden moral fault lines that subtly pit residents against one another in a national context that renders Dalits outsiders in their own land." Read an interview with the author on the Association for Asian Studies' #AsiaNow blog. Nathaniel Roberts is Research Fellow at the Centre for Modern Indian Studies, University of Göttingen. 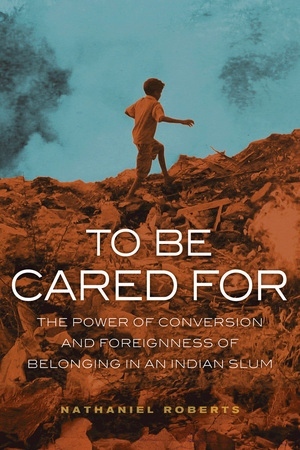 "To be Cared For is a richly layered critique of elite discourses and anxieties about caste and conversion in India through a moving and insightful ethnography of religious practices and morality among the profoundly dispossessed. At once about caste, gender, hunger, injustice, and caring, this beautifully written book carries an analytical heft rarely seen in such grounded ethnographies." "This is a remarkable book, supported by painstaking ethnographic research and written with clarity and sensitivity. To Be Cared For takes a hugely complex subject and gives us new points of departure. It shows how anthropological approaches to religion, identity, and conversion need to change. It helps the reader rethink the nature of religion, culture, and truth—matters urgent to people facing discrimination, extreme poverty, and acute uncertainty." "This remarkable ethnography tells a fascinating story with critical skill and compassion. Religion here is how people live, not what official doctrine says. Nathaniel Roberts gives us a complicated picture of moral contradictions and religious insights. This book is essential reading for anthropologists and others interested in the roles of religion in the modern world."